I regretted not going to Bohol when I solo backpacked Cebu years ago. Actually Bohol is one of my dream place for my next travel assignment next month. There's so much to see in Bohol that a quick stopover here is just a big no-no. I have listed the top tourist spots to visit in Bohol and definitely will be seeing this when I get here in the months to come. 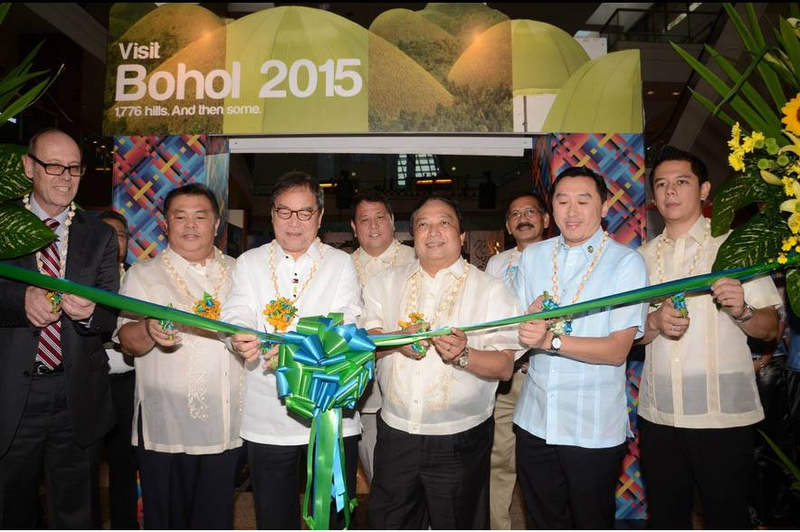 Chocolate Hills is the front-liner of Bohol competitive to world-class tourism hotspots. Declared as a National Geologic Monument, it is composed of a thousand cone-shaped hills with almost same size and elevation. It’s widely spread in Carmen, Batuan, and Sagbayan towns, but the Sagbayan Peak offers a different angle of awesome experience and panorama. Loboc River Cruise gives a captivating ride aboard a floating restaurant in the calm waters of Loboc River. It operates day and night which flaunts the vibrancy of palm-fringed banks and the nearby villages preserved in their local culture. Inside the Bilar Man-made Forest rests a passage en route to Chocolate Hills. This is a verdant forest of tall mahogany trees which makes the passage cool and loaded with healthy fresh air. Abatan River Community Life Tour is a cultural fluvial journey of Bohol. Aboard on the traditional bandong, people traverse along the Abatan River, through the villages of Cortes, Maribojoc, Antequera, Catigbian, and Balilihan, which starts at the grand Kawasan Falls. Along the way, everyone gets mesmerized in the enchanted Firefly-watching. The list goes on to the countless majestic natural wonders of Bohol that you must explore: Panglao Island beaches; the mystical Lamanoc Island and beaches in Anda; Cambuhat River and Village Tour in Buenavista; Banacon Mangrove Forest (Asia’s largest mangrove reforestation) in Gestafe; Candijay Mangrove Forest and Can-umantad Falls in Candijay; Sipatan Hanging Bridges in Sevilla; and the misty twin fall, Mag-aso Falls in Antequera. Global thrill-seekers make the most out from Danao Adventure Park, with E.A.T. Danao travel program; it stands for Eco/Educational/Extreme Adventure Tours. It is said that the park sits in the mountain ranges of what used to be the lair of Bohol’s foremost local hero, Francisco Dagohoy. This park offers a wide range of exhilarating activities, from rappelling, spelunking, kayaking, trekking, river tubing, root climbing, wall climbing and bouldering, to the adrenaline-pumping experiences of the zip line ride “Sui-slide”, cable ride called “Sky ride, and extreme aerial diving known as “The Plunge”. More fun and adventure can be found inland which includes spelunking in Sierra Bullones and Antequera. Carmen has a great terrain vehicle tour and mountain biking escapade around Bohol. Water tubing and paddling through rivers are also a jaunt to enjoy in this place. On the coastlines, aqua sports and island hopping provide even more adrenaline rush. Another park to explore is the G.R.E.A.T. (Green Recreational Eco-Adventure Tour) Catigbian D.A.T.E. Park, which is just a 30-min ride from the city. Bohol also has internationally-acclaimed dive spots, one of which is located southwest of Panglao which is the Balicasag. With scuba, an underwater view of one of the world’s most diverse marine life can be witnessed at Pamilacan Island. For more awe-inspired beauty of marine life, Cabilao Island (Loon) and Anda Peninsula are other wonderful dive sites. But an entirely a must-dive subsurface experience is offered by the Bien Unido Double Barrier Reef Marine Park which uniquely showcases the submerged 14-ft statues of the Blessed Virgin Mary and the Sto. Niňo. Featuring one of Bohol’s endangered species, the Philippine Tarsier and Wildlife Sanctuary specially protects the Philippine Tarsier, indigenously known as Maomag, where they are kept safe and free in their habitat in Corella. Tarsiers are a very small primate which can be as big as the human palm; they are nocturnal with heads that can rotate 180°. Rijah Sikatuna Protected Landscape is ideally built for conservation of the diversity of birds and wildlife, based in Bilar, where the Bohol Habitat Conservation Center is also located. This faunal home is the widest remaining forest in Bohol. A botanical garden enriched with over 3,000 varieties of plants and trees, Tarsier Botanika has a 9-hectare range located in Tawala, Panglao. An animal sanctuary also rests there, along with a stable with riding arena, and various collections of stone statues and other artistic creations. A close encounter with Macaques, a species of crab-eating monkeys, is offered by the Loon Mangrove Macaques Tour. This species has been around the mangroves, their natural habitat, for generations of hundreds of years. Spinner dolphins are an awesome sight off the waters of Pamilacan Island in Baclayon through the Dolphin Watching and Marine Life Tour. More exciting experience is seeing the huge whales which are occasionally seen between March and June. The playful dolphins are found year round. At least 18 species of dolphins and whales can be found in this area where they proliferate. The tour guides were actually former whale hunters, and now they turned to preserve their marine diversity, promote eco-tourism, and use their knowledge to share to enthusiasts. This is just the first part of the feature I will be doing for Bohol Tourism. Credits to Bohol Tourism Office for the information above.